Open Seals – (OST Type) The most common seal for regular-duty applications, open seals allow you to place the seal on after tensioning has occurred. Also occasionally referred to as snap-on seals. Closed Seals – (CST Type) Closed seals must be threaded onto the strap before tensioning. They are rarely used in regular-duty applications. Push Type – (PT Type) Sometimes called full overlap seals, push type seals are used with round bundles, and with pusher tools in heavy-duty applications. These seals must be threaded on prior to application. 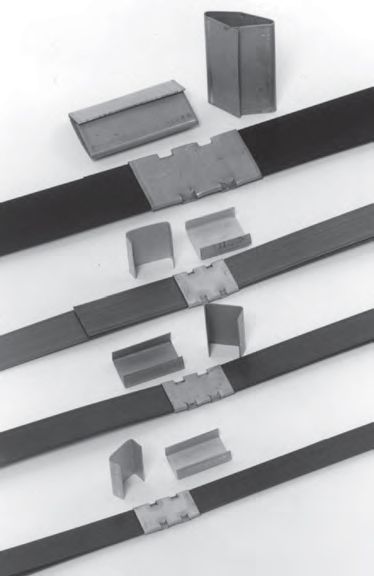 All PAC steel strapping seals are made from precision tested galvanized steel. Engineered for high joint efficiency with regular duty and heavy duty steel, all PAC seals meet federal government standards, along with ASTM Standard D3953. In addition to the stock sizes listed, we can also supply steel seals for many combination tools, including Signode.